Les Stroud will be teaming up with Todd Standing in the search for Sasquatch. Todd Standing is definitely a controversial figure in the Bigfoot Community. I have heard him called "the Rick Dyer of Canada", implying that he is just another hoaxer. 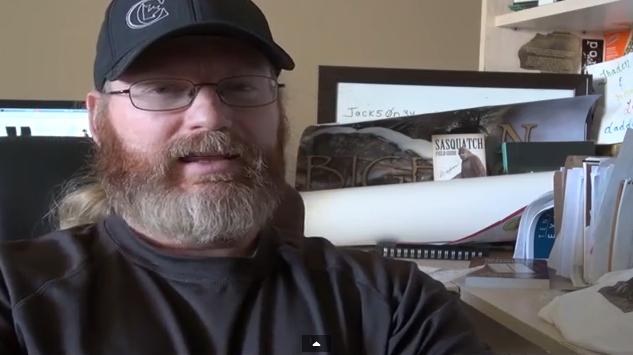 Here in this video he gives an update on his upcoming debut in the show, Survivorman Bigfoot. SURVIVORMAN BIGFOOT is a 2-part special airing on Travel & Escape Channel Wednesday, March 19th, 2014 at 10PM EST and Wednesday, March 26th, 2014 at 10PM EST. Discovery Channel US and Science Channel US have yet to release airdates. Show this all over the world, not just in the USA and Canada! All I have to say is I have lived my life 20 miles from Mt Adams in Washington state, the supposed 'hotbed' of 'squatch activity. For the past 40 years, I've spent at least 240 days in the forests and I can say with no qualms, I've never seen, heard or smelled anything that made me believe a wild ape lives in the area. One recent 'sighting' was not more than a 1/2 mile from my house. I suppose if I walked up on one I'd believe it. But I'm not taking the word of anyone who lives mostly in the city and makes money off 'hunting' for a mythical creature. IF these creatures exist and do have the capabilities commonly attributed to them, it is entirely possible that you may be being watched or that these elusive things can simply stay hidden better than you can find them IF you are ACTUALLY even hunting for them. The possibility of Les Stroud being duped by this guy are very low IMHO. Or are you ALSO insinuating that Stroud too is a scam artist with no credibility? My post above should have read, 240 days PER YEAR in the forests. Just because you have never seen it doesn't mean its not there. Prove that air exist.we can't see it, but we know its there. We see evidence of it. We breath it, we see the leaves in the trees move and flags wave. How Is it not so much also for sasquach. We have evidence of this creature too DNA that says unknown primate, legit foot prints, thousands reputable photos and videos (excluding frauds), stick structures and audio. All this circumstantial evidence would be enough to convict someone in a court of law..let us not dismiss so easy what the great Indians of the nations have seen and heard and talked about throughout their culture or deny all the historical accounts like Lief Erickson's account so many years ago. It is hard to find something that is elusive and intelligent especially in thousands of square miles of remote forest. Less Stroud has spent all his life in the woods and never seen him, but he will tell you he herd and experienced something he couldn't explain.he's doing the right thing. Keeping an open mind. we know air exists because we FEEL it when the wind blows, lol. I suppose you dont believe in WIND because you are not quite sure why the trees fall over. With all due respect, you idiot.